You can add Pepperjam's API on Strackr with your API key. 2. 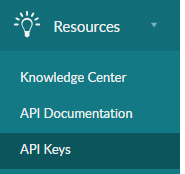 If there is no key you will have to contact your Pepperjam's manager to create a new key, then copy/past you API Key. And finally connect and access to your stats !